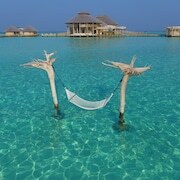 Located on the beach, this resort is in Medhufaru, within the vicinity of Randheli Arrival Jetty. Situated in Kuredu Island, this beach resort is in the same area as Komandoo Beach. 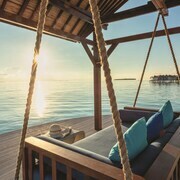 This beachfront luxury hotel is located in Kuredhivaru, where regional attractions include Orimasvaru Island Pier. Nestled on the beach, this Huruvalhi resort is next to a golf course and 0.1 mi (0.1 km) from Komandoo Beach. Within easy reach of Komandoo Beach, this Kudadhoo resort is located by the ocean and on the beach. 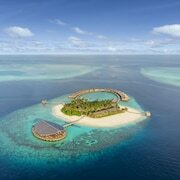 Situated by the ocean, this resort is 0.1 mi (0.1 km) from Komandoo Beach. Situated in Kanuhura, this luxury resort is in the same region as Komandoo Beach. Nestled on the beach, this Randheli hotel is 0.4 mi (0.7 km) from Randheli Arrival Jetty. Deluxe beach bungalows had an amazingly large outdoor enclosed bathroom complete with swing bed. Not crammed tightly amongst other bungalows and beautiful Maldivian décor - thatched roof, sala by the beach, etc. 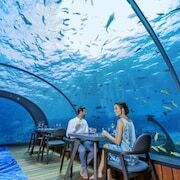 Good choice of restaurants although need to reserve ahead to secure, prices not too outrageous by Maldivian 5* standards. Only improvement would be the Waters Edge bar in the evening really needed a live singer/band/entertainment (outside) to attract people to chill out for longer. Those traveling to Medhufaru are sure to enjoy the sights to see and things to do. Those visiting the city may also want to enjoy things to do in the larger region. 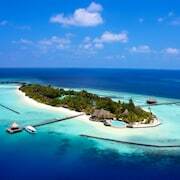 Places to visit in the larger region include Randheli Arrival Jetty, Kuredu Beach, and Kanuhura Beach. Additionally, you'll find Komandoo Beach in the area. As you book your getaway to Medhufaru, you might not find the perfect accommodation in the heart of the city, but below are lodging choices in the area. 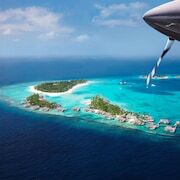 Soneva Jani is located 0 mi from the heart of Medhufaru. This 5-star resort in Medhufaru features 2 restaurants, an outdoor pool, and free WiFi. Kuredu Island Resort is 11.8 mi from the center of Medhufaru. 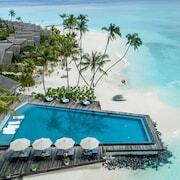 This 4-star resort in Kuredu Island features 3 outdoor pools, a full-service spa, and a golf course. It's a favorite with Expedia travelers for its beach locale and pool.